Four planes and 24 hours in transit but I made it without much trouble”¦ Kicking myself that I didn’t have my camera ready when we were soaring over the Amazon from Manaus to Belem, especially towards the end when an incredible view at dusk opened up to the west. Multiple giant rivers and vast interlocking estuarial canals, all heavily forested, all quite close to Belem, were framed by a thick layer of fluffy white clouds, a weird set of horizontal gray ellipse clouds in front of them, and then a high storm layer above it all, with the sun pouring through randomly in all directions. It was breathtaking! I had been assigned to a middle seat and thus, had put my bag away, out of reach, and couldn’t easily get my camera when I ended up in the window with the amazing view”¦ alas. You’ll just have to take my word for it! My first take on Belem this time is very different from my memory, but then I haven’t yet been to the historic center where I have this vivid memory of watching torrential equatorial rains falling on ancient Mangueiras (mango trees) and hundreds of mangoes falling into the rushing black runoff, hungry kids scrambling to grab as many as they can and stuff them in their shorts for safe keeping (that was 20 years ago!). Today a taxi took me on a long ride across the city (from the plane it was really quite big, many dozens of 15-25 story buildings dotting the urbanscape from the air), which resembled many other rides I’ve had like this in the past into such cities as Mexico City, Sao Paolo, Rome or Naples”¦ a seedy, crumbling cityscape, lots of the trappings of modernity, but somehow already sliding beyond that into a post-prosperity seediness, many structures covered in tags and inartistic graffiti, others just succumbing to the endless humidity and tropical decay that relentlessly confronts any attempt at permanence here. 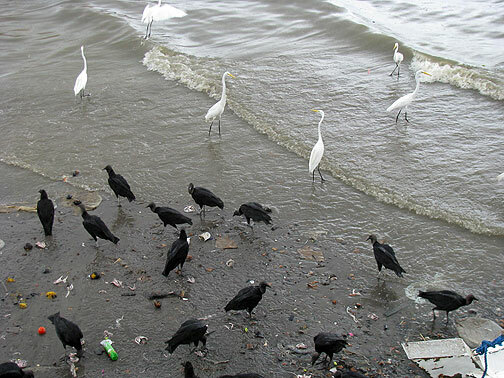 I started reading China Mieville’s “Perdido Street Station” on my way here and the dark, hybrid alien/animal/human/machine life forms in New Crubazon City seemed weirdly premonitory for what I might find here in this odd outpost just below the equator, on the shores of the Amazon as it meets the southern Atlantic. 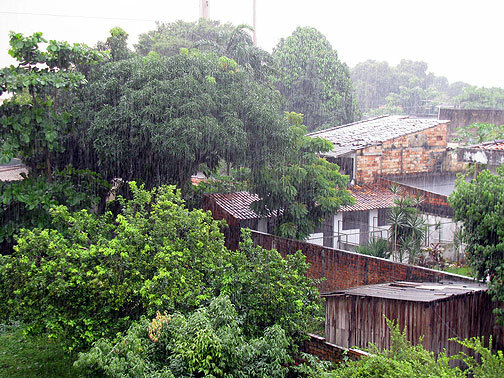 Equatorial rains pour down on Belem, this view from my balcony. The Workers' Party of President Lula has put these up around town. 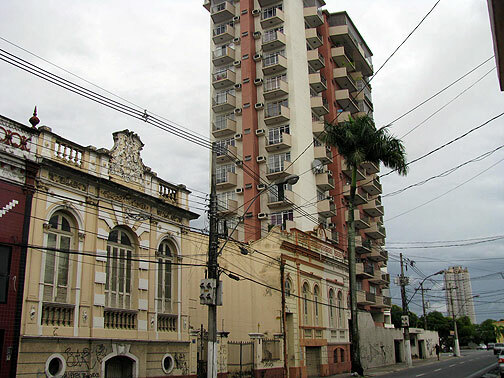 19th century low-rise structures, often covered in graffiti, sit side by side with typical highrise apartments. 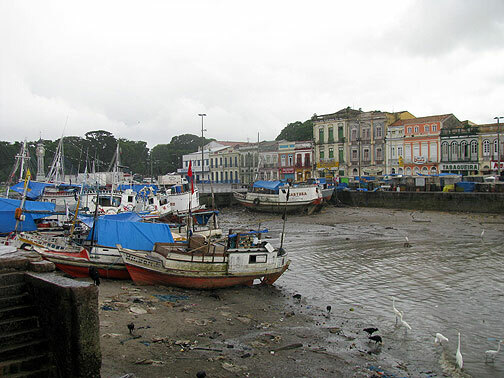 The old harbor in Belem, as the rain is starting again. Dinner time at the Harbor! 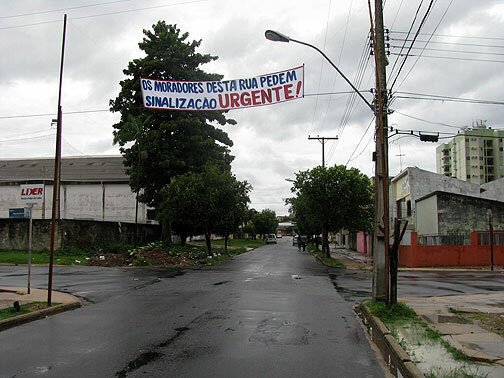 The street's residents demand signalization! Thanks a lot Chris for this exciting post. Please keep us informed about(also with pictures). Always enjoy your great blog. I am JoÃ£o Paulo (JP) from Coletivo Ecologia Urbana. Always interesting to read your posts. The ‘Coletivo’ will be in the march of FSM today in the bicycle block. Let’s try to meet during the march! Look for JP in the bicycle block or talk to Thiago. I’m accumulating contacts and stories as quickly as i can… in the program guide there are a number of Talks scheduled with Arabic speakers, stuff on Gaza and Israel, some Egyptians I think… but it’s hard to tell… the program guide is extremely out of sync with what a lot of folks are doing here. I am supposed to give a Talk on Nowtopia under the aegis of Ecologia Urbana of Sao Paolo, but neither the talk nor the organization is listed anywhere. There are two campuses, 80,000-100,000 people expected (many are pouring in as I write), and by all accounts, things are poorly organized at best. Lots of good will, sweet contacts with Belem locals, and a fun time earlier today sitting between some Members of Parliament from Aruba (trying to change $2,000!) and Cedric Gina the head of the South African National Union of Metal Workers and his colleague Dr. Aquina Thulare, Deputy Chairperson of the South African Medical and Dental Practitioners… we commiserated about Obama as a representative of the U.S. ruling class and how naive the big hope is for him… Gaza is on the news here in Brazil too… horrendous destruction, explicit, lengthy interviews with victims in hospitals and neighborhoods… my South African friends asked me if I could explain why Israel did it, but of course I could not… only at the level of a national madness… anyway, Gaza is having a big impact on people’s thoughts, at least based on very preliminary contacts and discussions… more to come. The graphic designers of the Workers’ Party need to have better communication with its translators. The Arabic version of “Welcome, Citizens of the World” is written backwards. 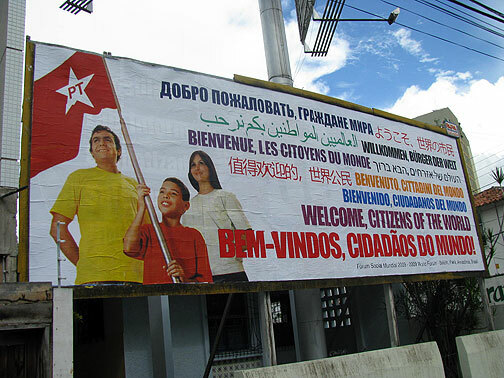 In other words, it reads like “Citizens global you we welcome”. Design programs often have a problem with right-to-left languages like Arabic and Hebrew, but this is something else entirely. I’d be curious to know if the Hebrew is correct. Was there anybody in attendance from the Arabic-speaking world?